Katharine, Arsinoe and Mirabella - three young queens born to fulfil their destiny - to fight to the death to win the crown. But before they were poisoner, elemental and naturalist, they were children, sisters and friends . . . 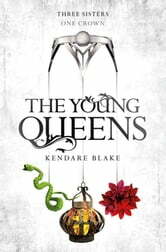 Discover the origin story of the three queens of Fennbirn in this exclusive e-novella from Kendare Blake, bestselling author of the New York Times bestselling, Three Dark Crowns. I have read the trilogy of these books. They are similar to The Hunger Games and Game of Thrones. I felt an enormous emotion of bewilderment, knowing that 2 of the Queen triplets had to die later, rather than sooner. I do not normally like fantasy genre, but I was hooked on the outcome of the Queen triplets. I loved her romantic themes, especially describing the scenery, of the islands. They reminded me of the Scottish Highland Isles, and the mainland was Scotland. What I was really impressed with was strong, dominant High Priestesses, not men, but women. I loved the connection and interaction between all the animal characters and the human characters. Braddock and Camden sound so lovable, despite being wild animals. Yeah I wouldn't mind reading more of Kendare Blake.